With the somewhat longer hiatus than usual between Solo and Episode IX, plus the ending of Rebels, the market was in need of some other form of Star Wars media to tide us all over. Enter Star Wars Resistance. Set prior to The Force Awakens, it follows a group of Resistance pilots, and…uhh, well that’s all I know. I haven’t actually seen any of it yet. I *have* seen the toys, or at least some of them, including my main man Poe Dameron, who I’ll be taking a look at today. 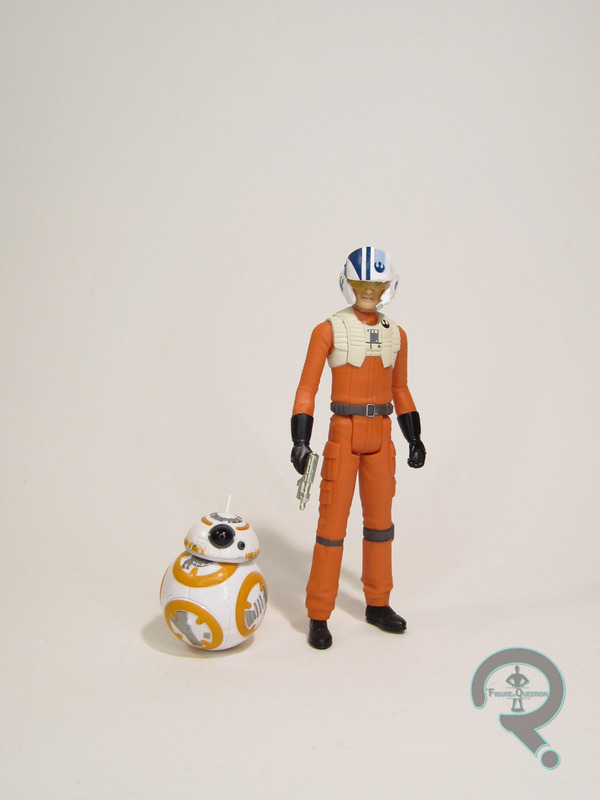 Poe Dameron and BB-8 are part of the launch for the Star Wars Resistance toyline. They’re a slightly more deluxe offering, which appears to be replacing the two-packs we got for Last Jedi and Solo. 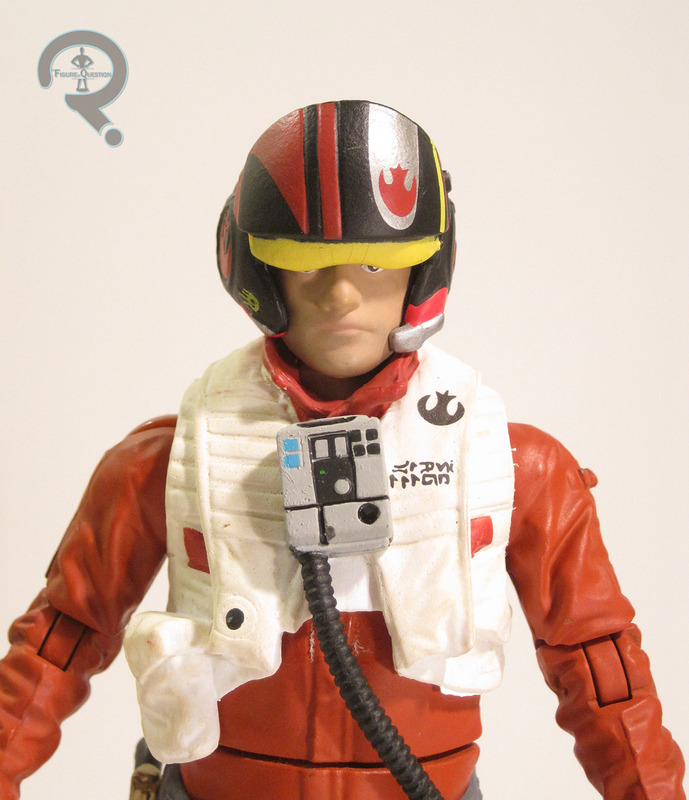 It gives us Poe in his X-Wing pilot gear, which appears to be (mostly) the same as it is in the films. The figure stands 3 3/4 inches tall and has 5 points of articulation. I was a little saddened to see him only sporting the basic 5 joints, after the Last Jedi pilot release added in wrist swivels, but there are enough figures without those joints that it’s not a huge surprise. Poe is sporting an all-new sculpt, depicting his animated design. Obviously, it’s not going to fit in with your basic movie figures, but he’s fairly similar to the Rebels figures we’ve been getting the last few years. He’s long and lanky, and the detail work is more on the reserved side. His head sculpt, despite being based on an animated incarnation, may very well be the best Poe we’ve seen to date, at least from Hasbro. He’s certainly more of a caricature than other figures, and it’s still not a perfect match, but it’s certainly better than I was expecting. Poe’s paintwork is pretty basic, befitting his animated nature. The application is pretty clean, and the face seems to have a bit more detail than I’m used to seeing on the basic figures. 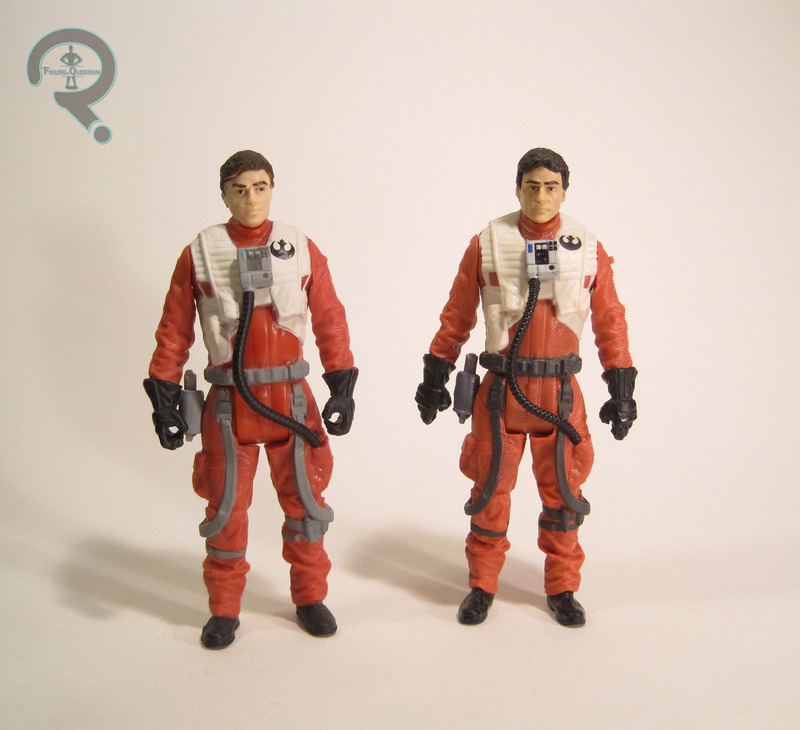 I’m wondering if this is a change in how the paint is done, similar to the printed faces for Black Series and Legends. I wouldn’t mind seeing something like this on future figures. 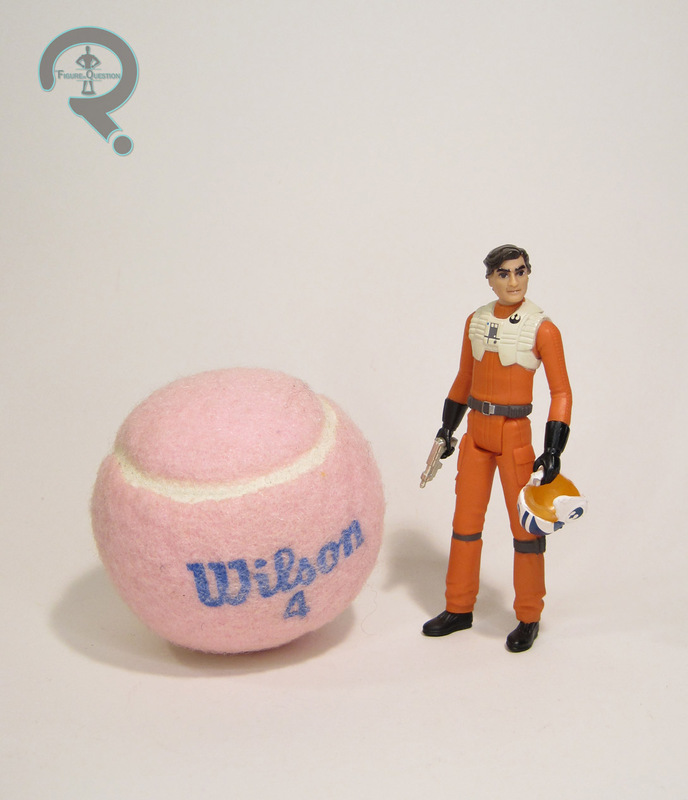 Poe is packed with his helmet (in the more generic blue and white, rather than his black squadron leader coloring), a blaster pistol, and, of course, BB-8. 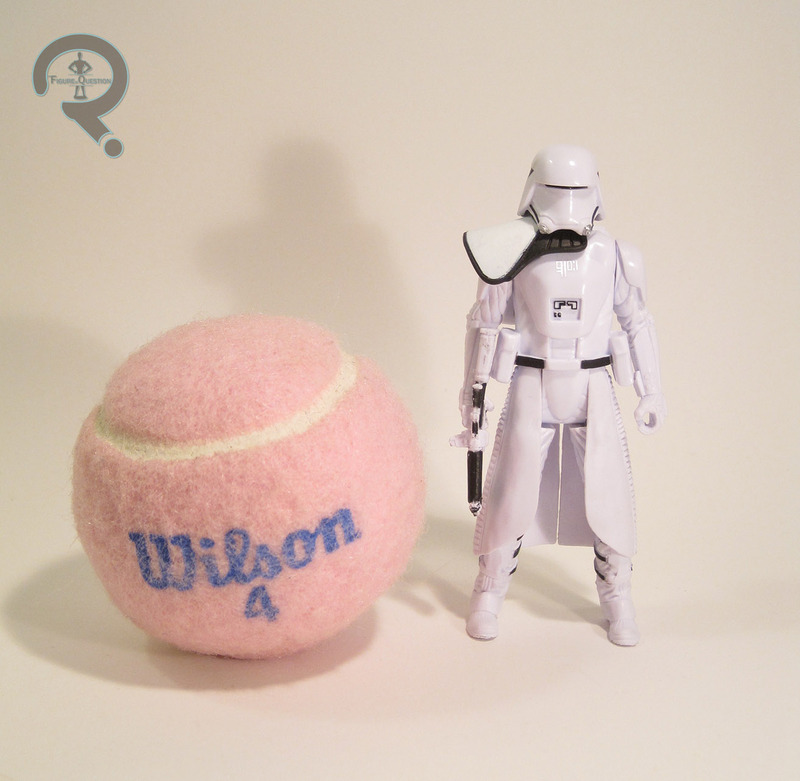 BB is about an inch tall and has the usual ball-jointed head. Unlike other small-scale BBs, this one doesn’t have the flattened out section at the bottom; he’s a proper sphere like the Black Series release. So, I *tried* to buy a Poe a lot earlier than I succeeded. While grabbing a few other things at Target, I saw him there, and thought “hey, there’s a Poe figure I don’t have.” Little did I know he was still street dated at the time, so I wasn’t able to purchase him. A week later, I was at the same Target, and all of the Resistance figures that had been there were gone. No Poe for me. Then I spotted him stashed back behind another item, and grabbed him, though I still wasn’t sure I’d actually be able to buy him. Well, as you can see, I was. Yay. He’s a fun figure. Nothing amazing, or Earth-shattering, but he’s nice. Man, I got a little side-tracked in my reviewing habits, and somehow, I’ve got this whole pile of “new” figures that have now gone months without being reviewed. So, I guess I gotta make my way through some of that piles. One of the lines that’s been the most neglected has been Hasbro’s relaunch of Mighty Muggs, which they’ve been trying to set-up as a competitor to Funko’s Pop! line. Their primary focuses have been Marvel and Star Wars. 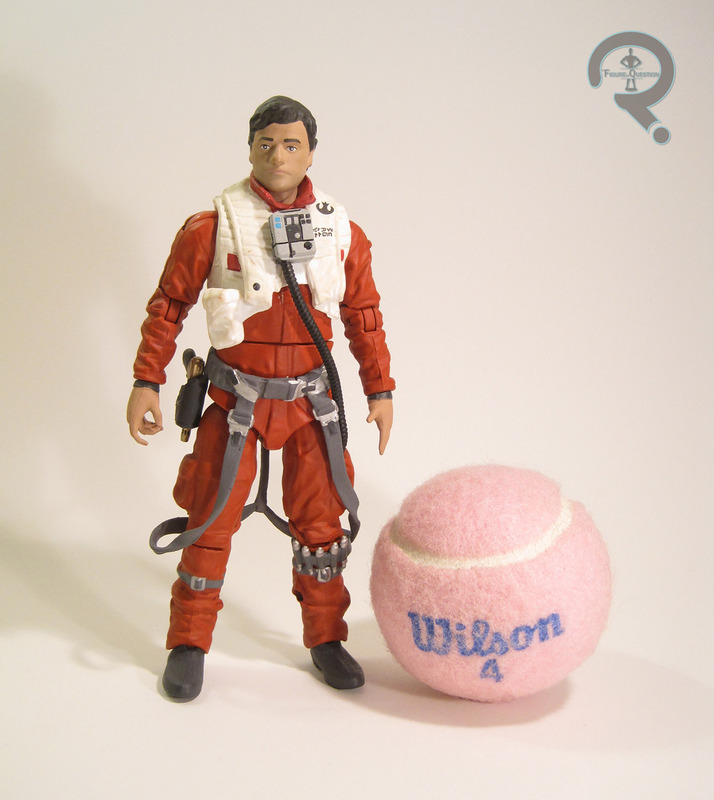 Today’s figure is Poe Dameron, from the latter license. 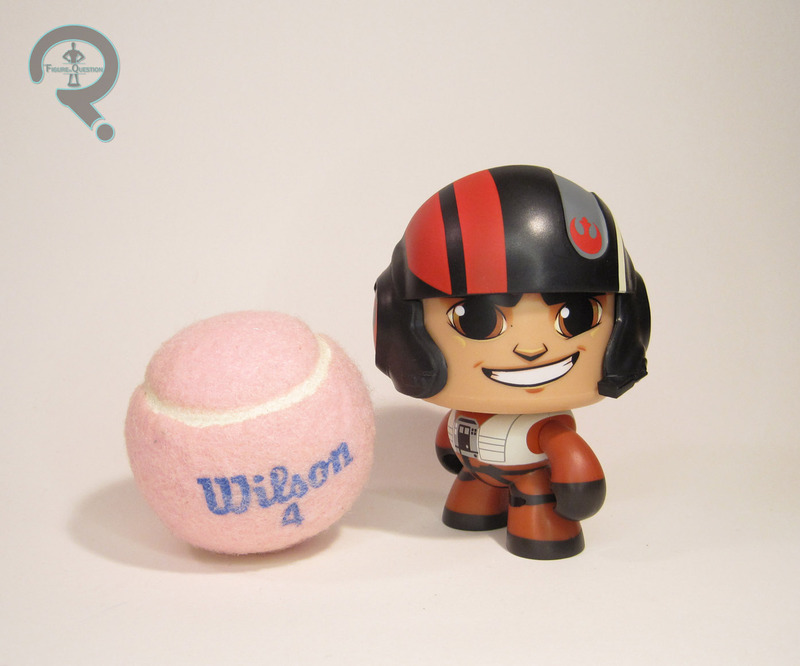 Poe Dameron is figure 9, part of the second assortment of Star Wars Mighty Muggs, which hit shelves a couple months back, right around the time Last Jedi was released on home media, in fact. Poe’s got a few different designs to go with, so this one goes with his pilot gear. It’s the one that crosses over from Force Awakens and Last Jedi, so I guess that makes it a reasonable choice. The figure stands 3 1/2 inches tall and has articulated shoulders, just like the other two I’ve looked at. Also, since reviewing the last two Muggs, I’ve discovered that the head *can* turn; it’s just really tight, and only ratchets into one of four positions. Still, it’s better than nothing. Poe uses the same body as Luke and Black Panther, but with a unique helmet piece, patterned after the helmet he wears in the movie. It’s pretty well-rendered and captures the look from the movie quite nicely. Poe, like the other new Muggs, features three different facial expressions. He’s got serious side-eyed, cocky smile, and intense and teeth-gritty. They’re all pretty decent, and actually have a solid likeness of Oscar Isaac. The slightly odd thing is that the cocky smile face doesn’t have the lenses like the other two. Not really sure why, but it makes giving him an unhelmeted look even easier, provided you can find a proper hair piece. I grabbed Poe from Target when he was first release. I was pretty happy when he was announced, and kept an eye out for him as soon as the line started to hit. 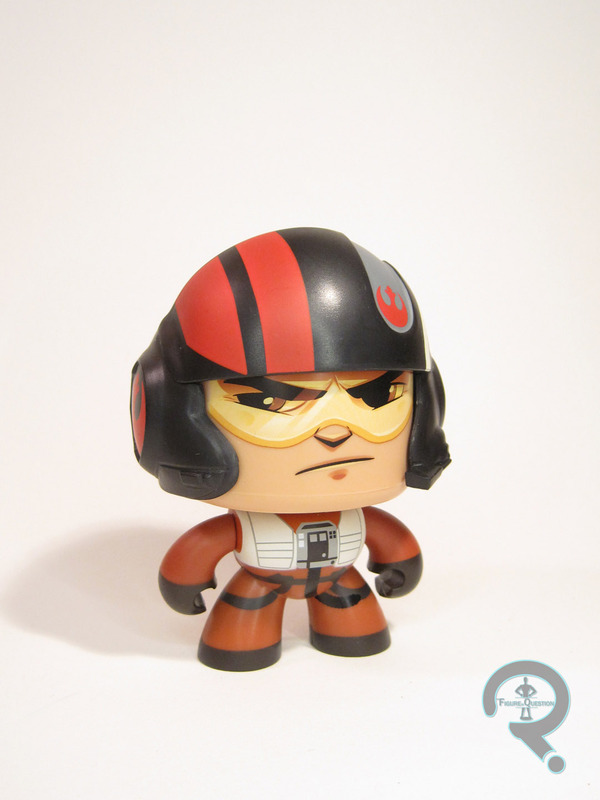 He’s not my preferred look for Poe, so I’d definitely like to see another one, but he’s a fun addition to my quickly growing Mighty Muggs collection nonetheless. 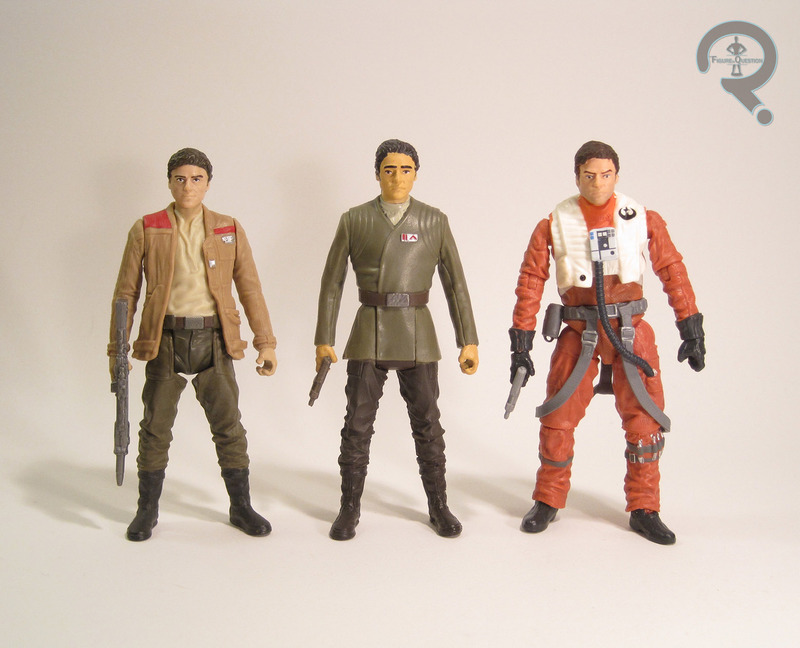 Disney’s die-cast Star Wars: Elite Series is one of those lines that has a tendency to slip under my radar. It’s not that it’s a bad line or anything, it’s more that it’s a line that’s exclusively available at Disney Stores, and those aren’t the sort of thing I tend to visit with much regularity. As it stands, my collection of figures from this line is mostly confined to just my very favorite characters, which includes today’s focus, Poe Dameron! Poe is part of Disney’s Last Jedi-themed assortment of Star Wars: The Elite Series. 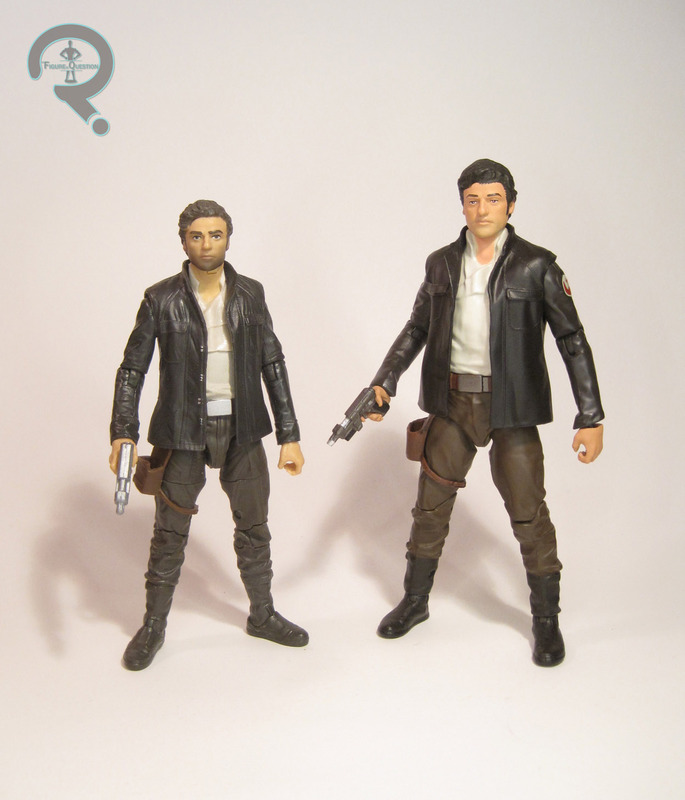 He wasn’t in the initial assortment of figures, but was instead one of the seven figures released solo after the fact. Poe hit stores on November 7th of last year. Like most of his other figures from the movie, this Poe is based on his jacketed look from TLJ. As his most prominent look by far, it makes sense, especially since his pilot look was already covered for TFA. Poe stands 6 1/2 inches tall and he has 18 points of articulation. As with prior Elite Series figures, the vast majority of this guy is made from die cast metal. His head, hands, feet, and jacket are plastic, but that’s it. I was impressed to discover that Disney’s made some improvements to how they construct these figures since the last Poe. This one isn’t nearly as stiff and restricted as the last one when it comes to posablity. In addition, the overall quality of the sculpt seems to have improved. The details are much sharper, especially on the plastic parts, but on the metal parts as well. He’s still slightly less detailed than the average Hasbro figure, but he’s certainly a step-up from the last figure. It’s the little things, like his hands actually looking like hands, or the assembly screws on his back actually having mostly inconspicuous caps on them. Then there’s the head. I’m not 100% sure if the head sculpt on this figure is new or not. Given how different it looks, I initially assumed it was all-new, but after comparing the two side by side, I’m starting to think this might just be a better pressing of the mold, coupled with some much, much better paint. 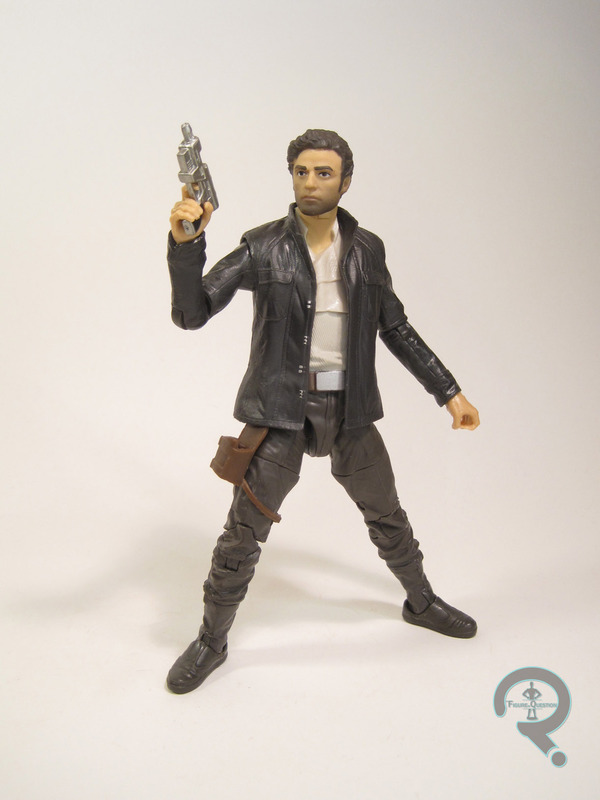 Regardless, it’s the best likeness of Oscar Isaac we’ve seen so far, out pacing even the recent Black Series offering, which I thought was pretty good in its own right. Poe’s paint work also marks a definite step up for this line. It’s a lot less thickly applied here than on prior figures, and there’s far less slop. 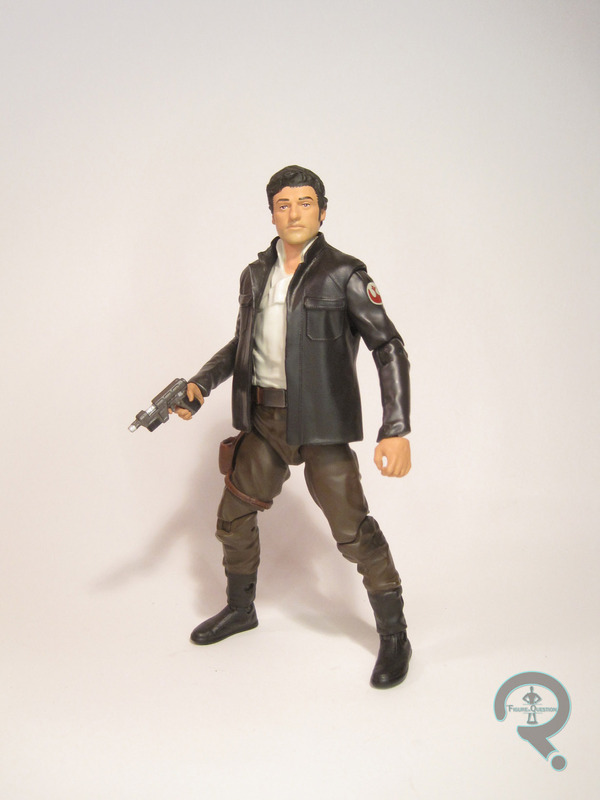 He’s also got some very clean work on his face, and I was certainly happy to get a Poe figure in a larger scale that doesn’t try to slather on a bunch of grayish paint in the hopes of replicating scruff. Poe includes his blaster pistol and a display stand (same as the other figures). It’s sad he couldn’t came with something else, especially since the last Poe had the helmet, but I suppose it’s not terrible. I’m always looking for an excuse to buy a new Poe figure, and the Elite Series Poe from TFA was actually one of his better figures, so I was definitely on board for picking up this guy. The only trouble was actually finding him, since none of the stores near me got him when he was first released. A few weeks ago, I was killing some time at the local mall, and remembered I hadn’t yet found this guy, so I swung by the Disney Store there, and they had finally gotten him in. Upon purchasing him, I realized he’s actually the first figure from this line I’ve paid full price for. Of course, he’s by far the nicest figure I’ve gotten from this line as well, so I don’t feel that bad in that regard. Now I’m tempted to check out some of the other TLJ figures, since Poe seems like such a step up. If that bio sounds familiar to you, it’s because you’re losing your mind! 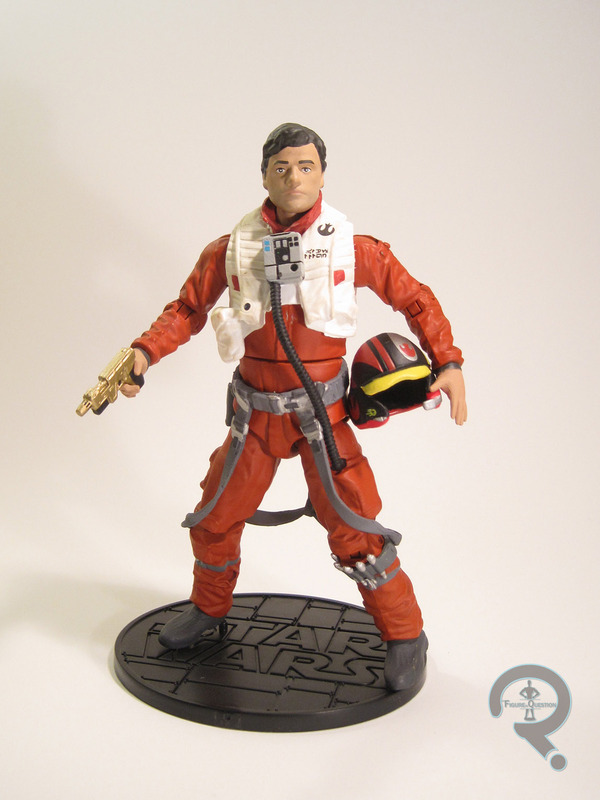 Nah, it’s actually because it’s the exact same bio that was used on the Black Series Captain Poe Dameron figure. He’s the same guy and all, so I guess it’s okay. So, today I’m breaking from my trend of Black Series figures, and switching gears over to the line that’s sort of the exact opposite, at least from a collecting perspective, Titan Heroes. Let’s have a look at the figure! Poe was one of the first three The Last Jedi-themed Star Wars: Titan Heroes, released back in September for Force Friday II, alongside Rey and a Stormtrooper. He was also available in the big Target-exclusive 6-pack with Rey, BB-8, Kylo, and two troopers. The figure stands 12 inches tall and he has 7 points of articulation. His construction is pretty much the same as the other two Titan Heroes I’ve looked at, with the main body being molded in a harder, hollowed out plastic, with softer pieces for his head and hands. He’s also a little skinny like those two, but that’s really just the aesthetic of the line. Poe’s sculpt is surprisingly good, given the line he’s from. These figures tend to be more on the basic side, but Poe is quite detailed, and the head in particular is one of the nicer sculpts I’ve seen out of this line. 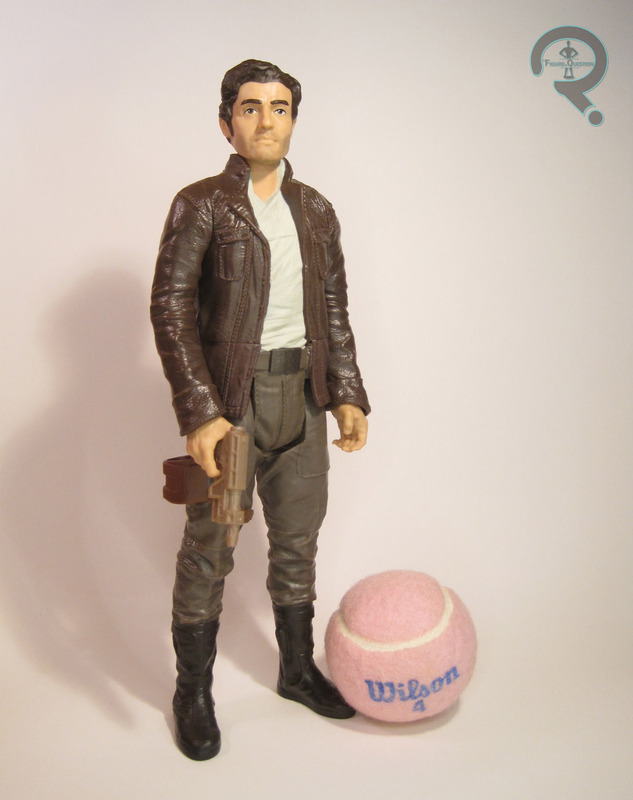 I can’t say it’s a spot-on recreation of Oscar Isaac, but it’s pretty decent, and it looks like a real human being, which is certainly a step-up. The work on the body is also pretty decent, with lots of texture work. The hands in particular impressed me. His paint work is also pretty decent, again, given the style of the line. What I found most impressive was the work on Poe’s face scruff. It’s something that Hasbro’s been unable to handle with any sort of subtlety on any of their Poe figures, but they actually managed to do it really well here. Hopefully, this will translate to future figures. 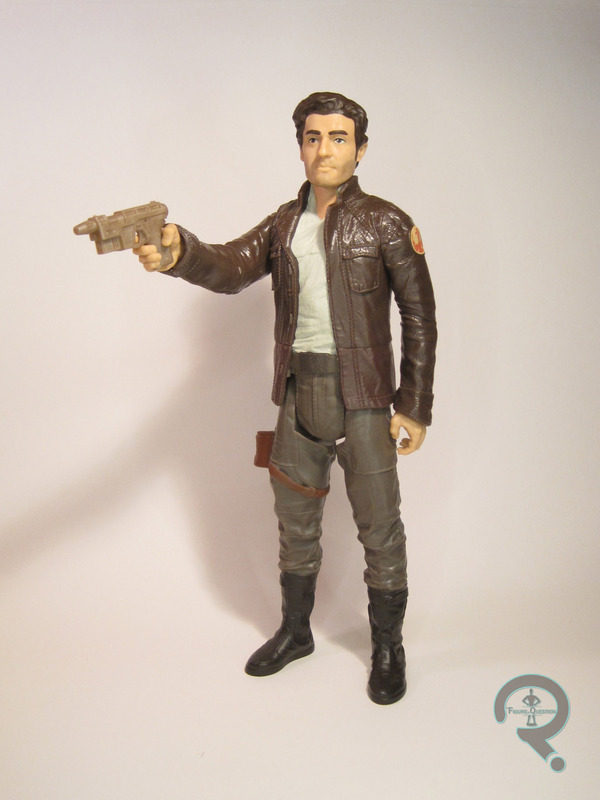 Poe is packed with his usual blaster pistol, sadly without any painted details, but well-sculpted nonetheless. After picking up Rey on my own and then getting a Finn for Christmas, I figured I might want to track down a Poe from this line, just to complete my power trio set. I ended up finding him at the same time as the Black Series Finn and Kylo figures. He was a bit of a spur of the moment purchase, since I had just seen the movie, and it was a Poe figure I didn’t have and he was relatively inexpensive. That said, I’m happy I picked him up. He’s a better figure than I’d expected. What’s this? 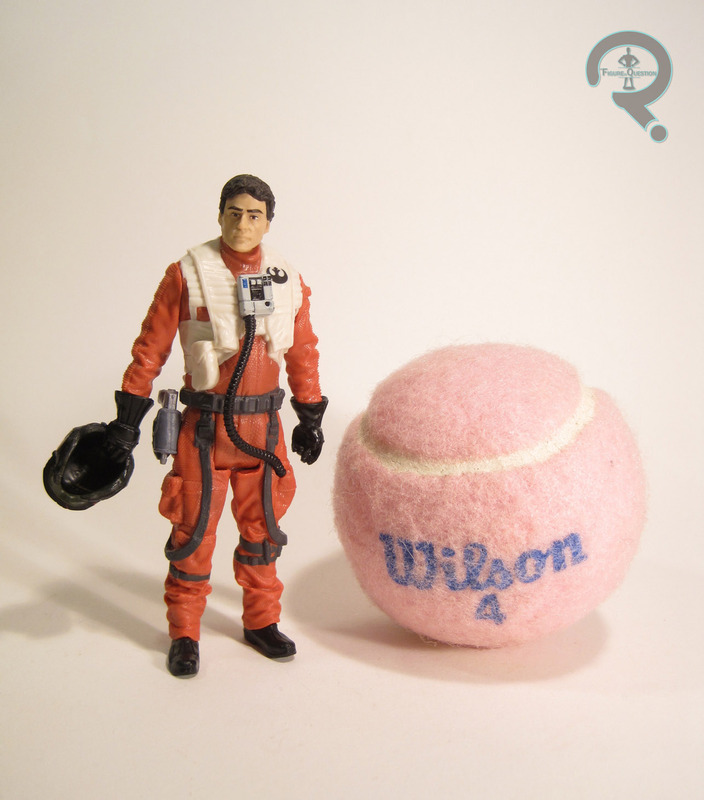 Another Poe Dameron figure? On this site? Gadzooks, what a shock! Okay, all joking aside, yes, I’m looking at another Poe Dameron figure today. Now, this is in part because I just really like Poe and therefore want as many figures of him as possible, but it’s also because every single Poe figure released so far has been compromised in some way. So, let’s see how the latest fares, shall we? 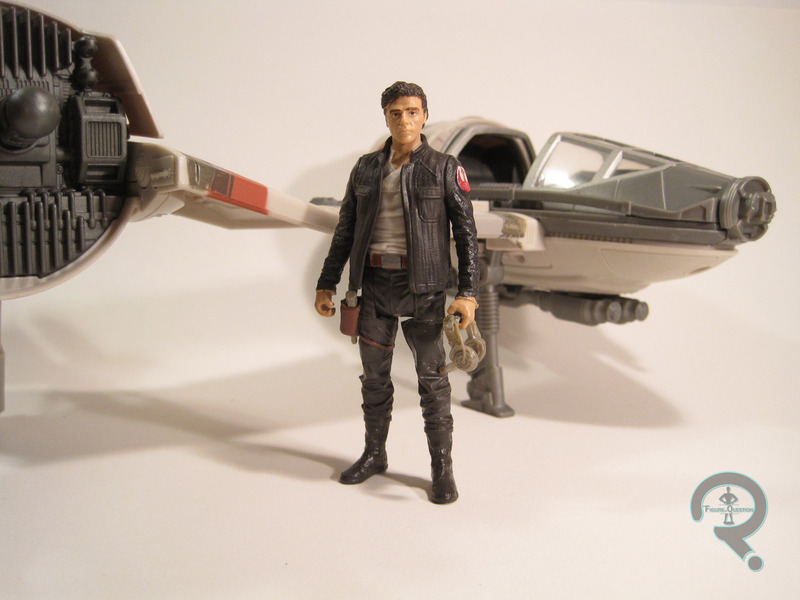 Captain Poe Dameron is part of the second assortment of The Last Jedi-themed assortment of Star Wars: The Black Series. He’s figure #53, placing him right after Leia, and he’s also the first proper Last Jedi Black Series figure I’ve looked at on the site. As the rank in the name may have clued you in, this Poe is sporting his brand new jacketed look. It’s the more obviously different of his two main looks from this film, so it makes sense for this release. The figure stands about 6 inches tall and he has 27 points of articulation. It’s an all-new sculpt, which I’d definitely say is for the best. 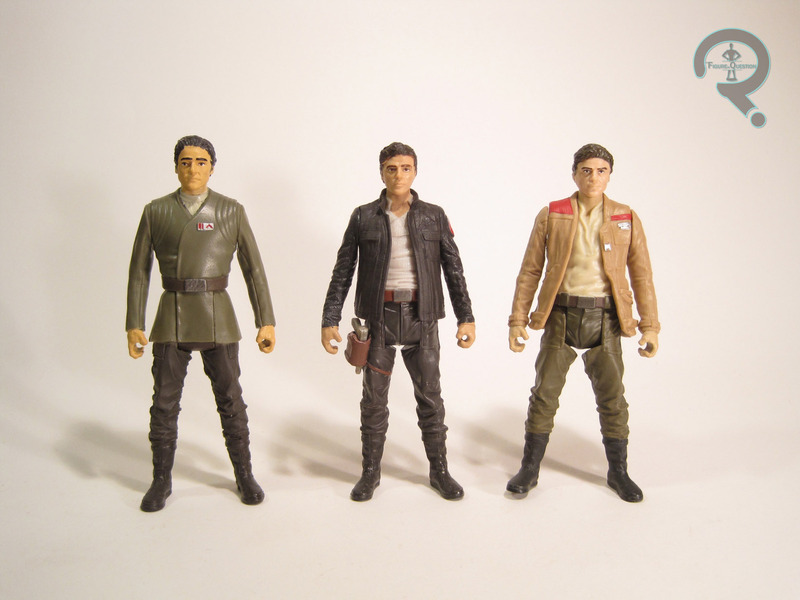 Not only does the design not have much overlap with prior Poe designs, the last two Poes in this scale were also not super great when it came to sculpts. 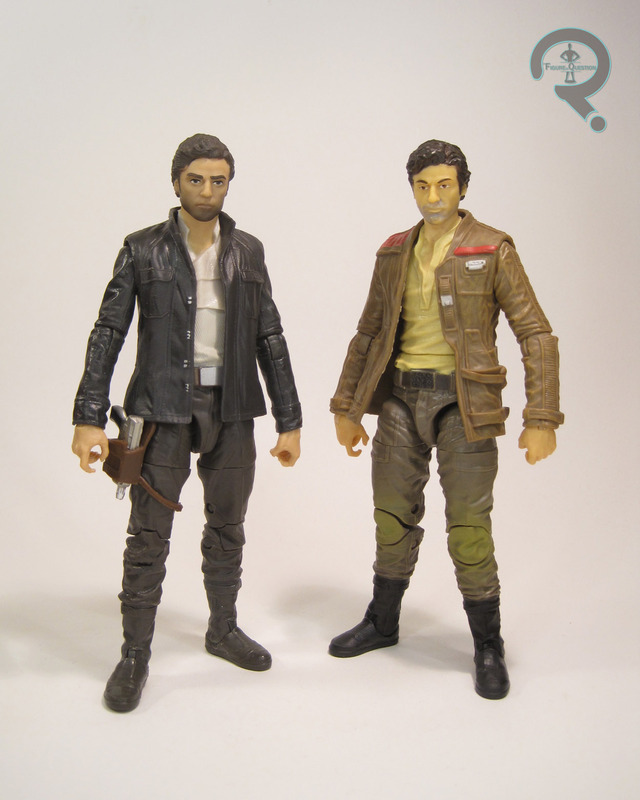 In particular, Hasbro’s had a lot of trouble nailing down Oscar Isaac’s likeness, especially on the larger figures. Without a doubt, this figure has the best Isaac sculpt we’ve seen to date. It’s still not 100% there, but it’s definitely close. I think the thing that really sells it for me is the nose. Isaac has a very distinctive nose, and I think this figure really gets that down. Not to be outshone by the head sculpt, the body’s got some pretty awesome detail work going on. Gone are the issues with odd spots of softness like we saw with the prior Poes. Paint on this figure is also a notable improvement on the prior figures, but given just how bad the last two Poes were in that department, it means there’s still a bit of room for improvement. The basic paint is way cleaner, and the details have a very pleasant tendency to not totally miss the spots where they’re supposed to go. 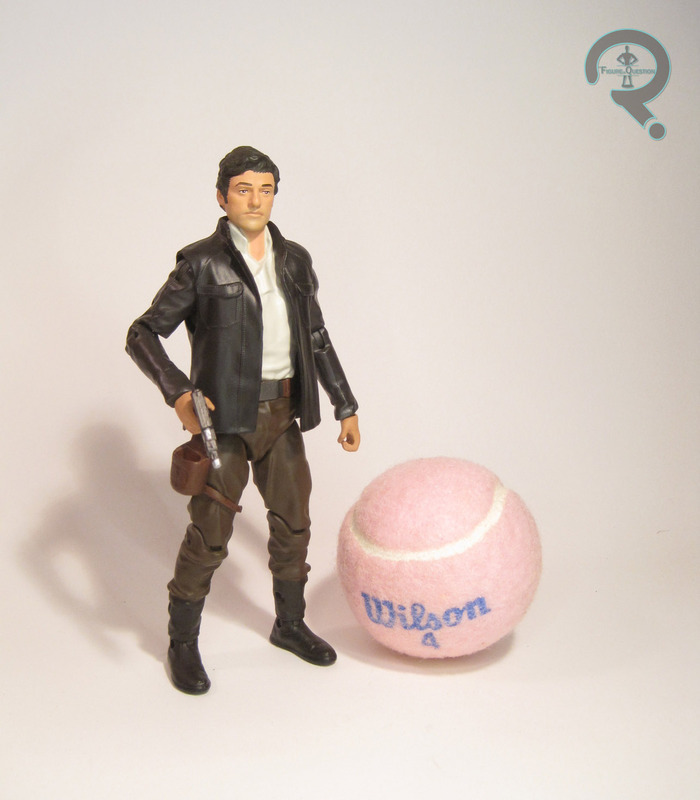 Hasbro still seems very much perplexed by how to handle Poe’s slight stubble. It’s still way to dark (at least on my figure; there’s a good degree of variance from figure to figure), but at least it doesn’t look like he just slathered solid grey paint on his face. It certainly helps the likeness to shine through a little bit better. Poe is packed with his smaller blaster pistol, which is actually painted all of the correct colors this time. I wouldn’t have minded a little bit more, but it’s better than nothing. I got Poe as the same time as yesterday’s Leia. As much as I can appreciate the prior figures for what they are, they definitely left a little to be desired. Early shots of this figure didn’t look much better, but once in-hand photos started showing, I definitely knew I wanted one! The figure still has a few minor problems, but he’s hands down the best version of Poe to date. Didn’t I *just* review a Poe Dameron figure? Like, two days ago? Why yeas, observant reader, I did. But there’s a second Poe in the initial The Last Jedi offerings, and as an admitted Poe-fanboy, I of course picked up both versions of him. It’s just what’s done. So, without further ado, here’s a second Poe! Poe was released in the first series of The Last Jedi figures, as part of the Orange assortment. 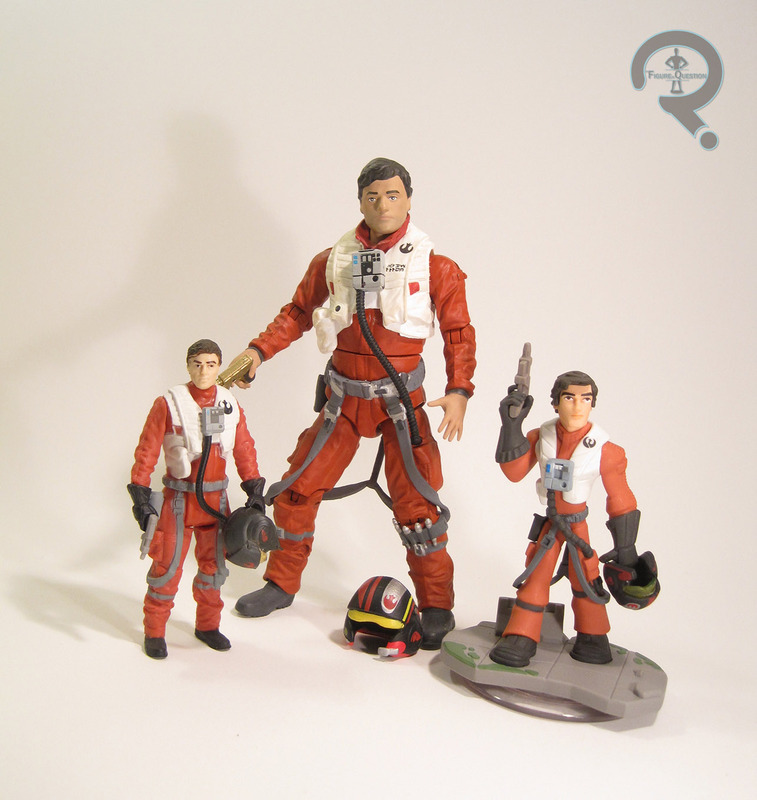 The last figure gave us Poe’s “casual” look, but this one gives us his X-Wing pilot gear. It looks like his pilot stuff will be largely unchanged, which seems fair enough. The figure stands about 4 inches tall and he has 7 points of articulation. Yes, you read that right; he has 7 points, not 5. That’s because this Poe figure has wrist articulation! Oh yeah! Now we’re movin’ on up! At first glance, this figure looked to be the same sculpt as the Poe included with the TFA X-Wing, but after opening him up, it appears he’s an entirely new sculpt. It’s very similar to the prior sculpt, but everything is much sharper, there’s much more texture, and there’s some slightly tweaked details. It’s really a much better looking sculpt. The head isn’t quite as close to Isaac as the Captain Poe, but it’s a cleaner sculpt than a lot of the prior figures, and isn’t a terrible likeness. In terms of paint, this guy’s quite nicely handled. The details are all a lot bolder and more precise than the last pilot Poe, which is much appreciated. Poe is packed with his helmet and small blaster. Both pieces appear to be the same ones used on the last pilot Poe, but the helmet is actually black this time and looks to be closer to the actual prop than the last one. Okay, so, despite my whole Poe-fanboy thing, when the images of all these figures first started showing up, I can’t say I was much excited by this figure. He really just looked like a straight re-release of the TFA figure, and I already have that one. When I found all the figures early, I took a closer look and noticed he seemed at least a little bit tweaked, but I still wasn’t biting. So, why did I get him? Well, Target had this nifty “Spend $100, get a $25 gift card” promotion on the Star Wars toys, and Super Awesome Girlfriend and I were $5 short of $100, so I got Poe. I’m glad I did, because he has a lot more to offer than I initially realized. While the vast majority of the Force Friday haul was action figures for Ethan, I did manage to pick up something for myself, and, big surprise, it’s a Nerf blaster. 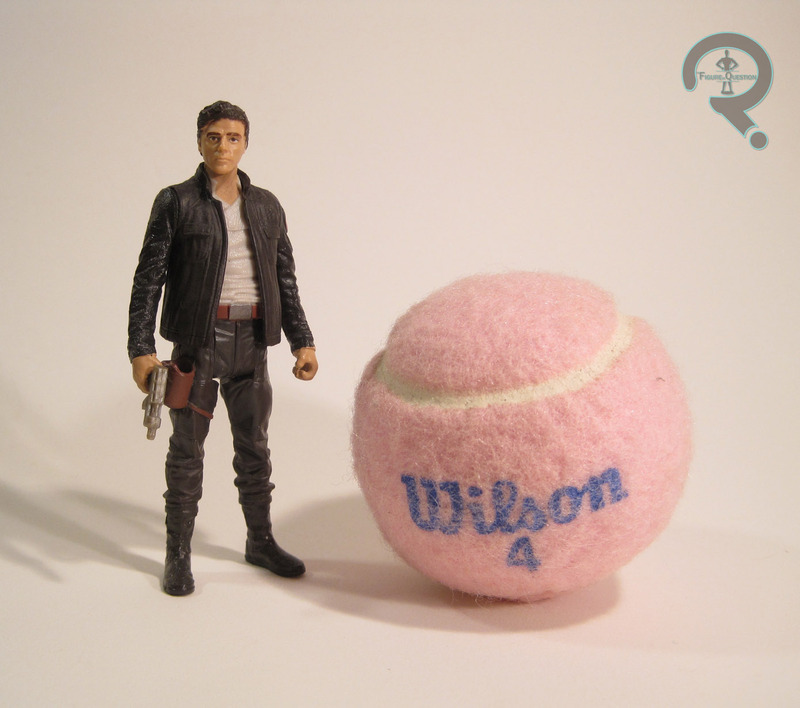 It is the smallest and cheapest of this year’s Star Wars releases. I am, of course, talking about the Poe Dameron Blaster pistol. Let’s take a look at it. 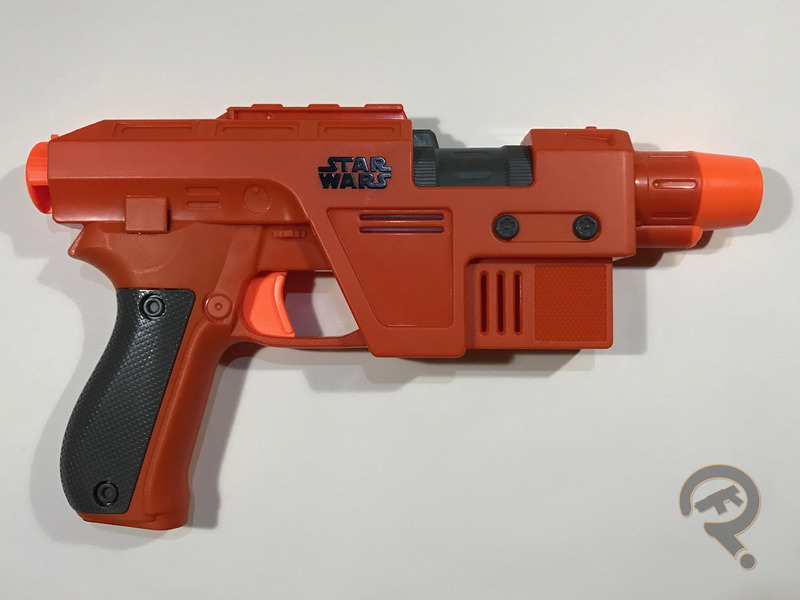 The Poe Dameron Blaster was released in 2017 as part of the Force Friday lineup of new products promoting the upcoming Star Wars Episode VIII. The blaster is about as simple as it gets, mechanically. It is a single shot muzzle loaded pistol with a priming tab in the rear of the blaster. The tab is a separate piece from the plunger and has its own return spring so it doesn’t stick out the back of the blaster when primed like the Nitefinder or Firestrike. In addition to priming the action of the blaster, pulling the tab back also activates the Glowstrike feature which is part of every Star Wars branded blaster at this point. There is a single purple LED with a clear inner barrel that “charges” up the dart so it glows in the dark when fired. The light turns off following a trigger pull which, in turn, fires the dart and sets off the blaster’s light effect and sound. I can’t speak for the accuracy of the sound as the film has not yet come out, but I have to say I find the light effect a little disappointing. I wasn’t expecting the same level of light effects as are on higher end blasters, but the single light on only one side of the blaster feels a bit underwhelming. This is only accentuated by the fact that the light stays on for almost a full second after the trigger is pulled. Even with the lackluster setup, I would have much preferred a quick flash of light than the drawn out night light effect the blaster has. 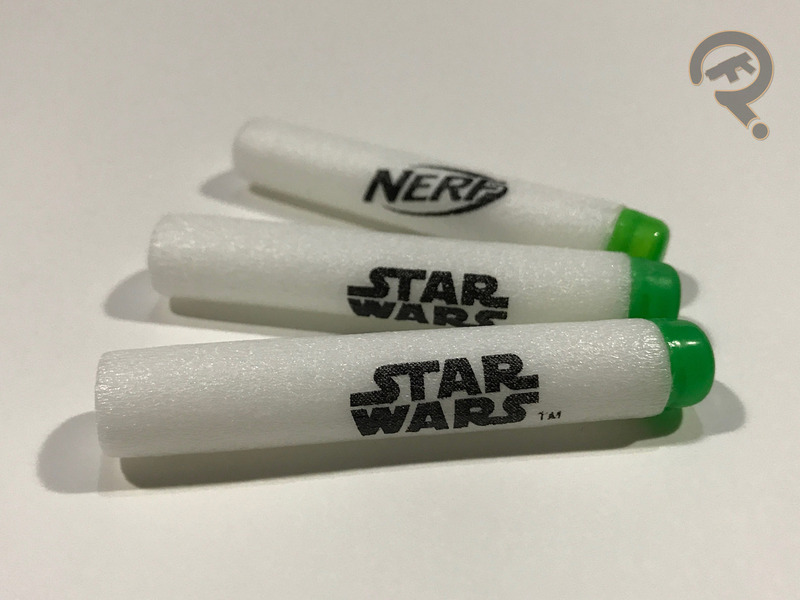 Ultimately, it’s kind of a nit-picky criticism to make, but I know Nerf have the capability to deliver better and I wish they had done it just a little different. The form factor of Poe’s blaster, thankfully, brings us back to the positives. Like with most of the prop blasters in Star Wars, Poe’s blaster in the film is built on the frame of a real world firearm, in this case the Sig Sauer P226. 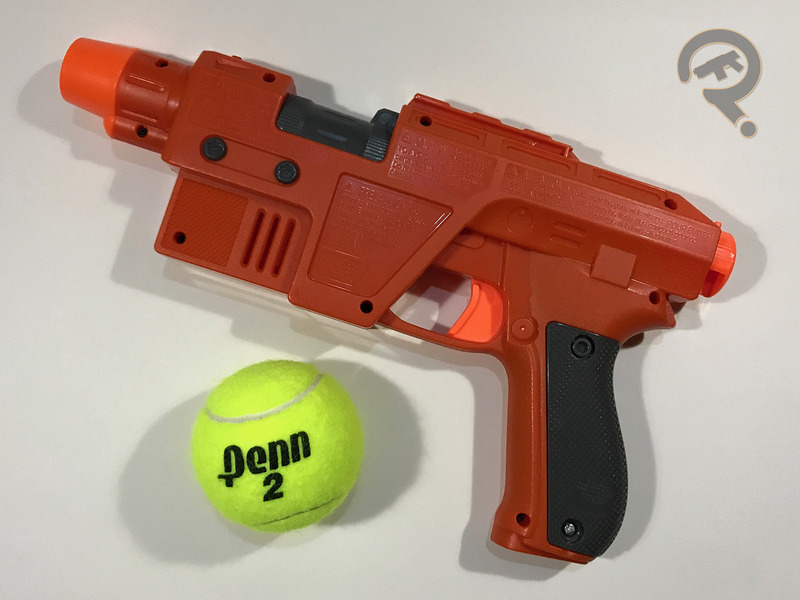 This won’t matter to 98% of people who buy the Nerf replica, but what it means is that the grip is exceptionally comfortable. It may seem like a small detail, but if a blaster is genuinely pleasant to hold, even if it’s only so-so otherwise, I’m much more likely to pick it up and pew pew around my house than I am with a functionally superior but less comfortable blaster. The handle also houses the single AA battery that powers the light, sound, and Glowstrike feature. The little bit of extra weight in the grip also helps with comfort. The build quality is good and everything feels solid, as you’d expect from a Nerf blaster. Poe’s blaster has an attachment rail on the top for accessories if you really think it needs them. Unsurprisingly, Poe’s blaster is a bit underpowered compared to the Elite series. This is the case with just about all licensed blasters Nerf makes so it’s not surprising. This is an indoor blaster, plain and simple. It doesn’t pack nearly the same punch as core Nerf blasters, but that just means you’re less likely to accidentally injure your younger siblings when you burst into their room. Besides, the glowing darts and sound effects leave enough of an impression to make up for it, especially for nighttime ambushes. The Poe Dameron Blaster comes packaged with 3 Star Wars branded Glowstrike darts and one AA battery already installed. To be completely honest, I was pretty disappointed with this years selection of Star Wars Nerf. I didn’t even buy this blaster just because I wanted it but because Target was giving away freebies if you bought something from Force Friday. That being said, do I regret buying this blaster? No. It has plenty of issues and I wouldn’t put it anywhere near my top 10, but for what it is, I feel like I’ve gotten my money’s worth out of it. And besides, it’s just so dang comfortable. The Star Wars franchise has a history of introducing fun new vehicles with just about every installment. The Force Awakens didn’t do this as much, preferring to stick with variations of some old favorites, as a call-back to the older films (I didn’t mind). The Last Jedi looks to be meeting somewhere in the middle, giving us both old favorites and some new designs. I’ll be looking at one of the newer creations (though, if the bio’s any indication, that’s not the case “in universe”), the Ski Speeder, which looks to be the standard Resistance transportation following the trailer’s ominous hints at the destruction of their old fleet sometime during The Last Jedi’s runtime. 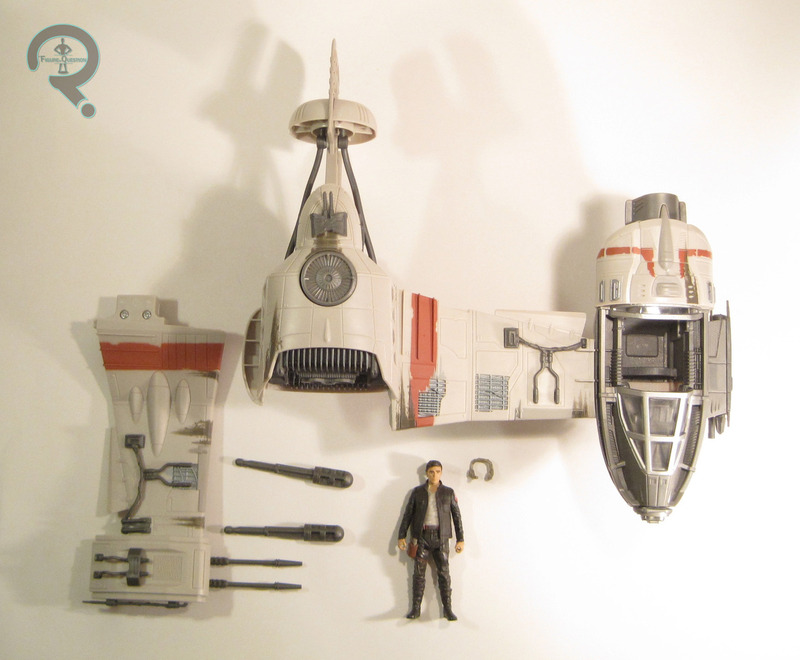 Hasbro’s offering a small-scale version of the vehicle, packed with ace Resistance pilot, Poe Dameron! The Resistance Ski Speeder was one of the launch items for The Last Jedi’s Force Friday II event. It’s a C-Class-sized vehicle, and is the only one of its size at launch time. Time will tell if that’ll change later. In terms of assembly, this vehicle’s a bit easier than the last few vehicles. 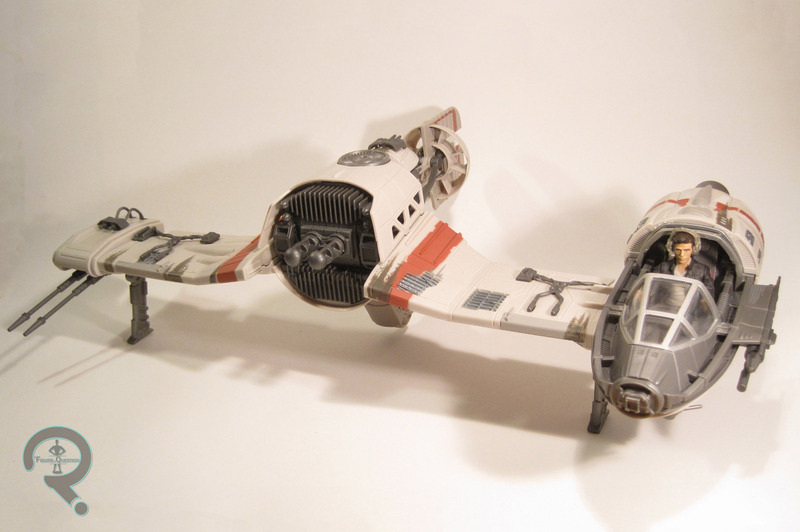 Pop on the right wing, the stabilizer strut, and a blaster cannon and you’re good to go. When fully assembled, the vehicle measures an impressive 18 inches long and stands about 5 inches tall when sitting and about 8 inches when the strut is fully extended. In terms of moving parts, there’s the landing gear, which drops out of either wing, as well as a very small rotating gun on the left underside of the cockpit. There is *not* an opening cockpit hatch; it’s open-topped, which does appear to be accurate to the film. The Ski Speeder is sporting all-new tooling, based on its film design. Though they may be a new design, the Ski Speeders definitely take influence from earlier ships, most notably the Rebel B-Wing, which it should be noted is one of my favorite OT ships. I tend to like this design, as impractical as it would be in real life. From what we’ve seen of the Ski Speeder, this toy does a respectable job of translating it into plastic. 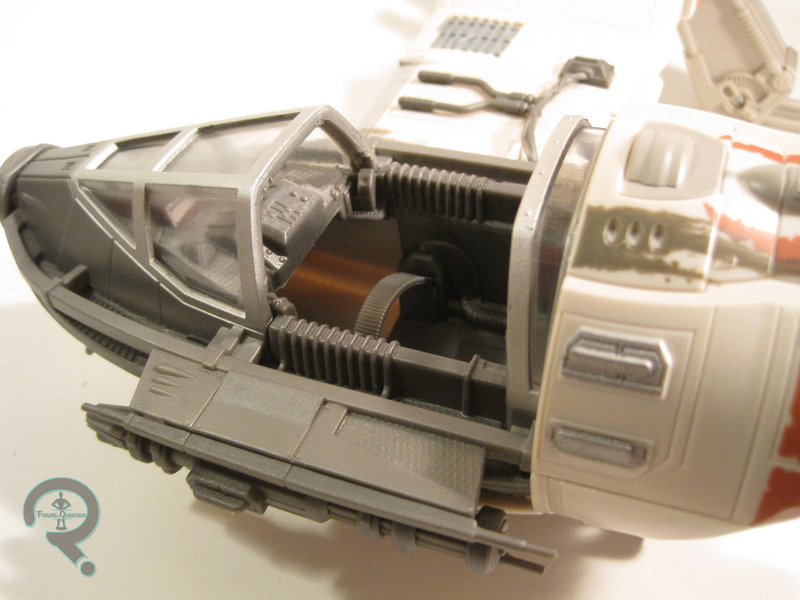 Like a most recent SW vehicles, the Speeder looks to have been scaled down a little bit from its on-screen counterpart. It doesn’t look to be as expensive as the AT-ACT or even the Resistance X-Wing, which is likely due to the ship’s more feasible size. The details have also been slightly simplified, so as to better fit the line’s overall aesthetic, but once again, it seems to be a less drastic change than we’ve seen previously. There’s still quite a bit of detail on this thing. Paintwork on this vehicle is a step up from recent vehicles. It’s still not quite up to the level it used to be from Hasbro, but there’s a bit of weathering and such, which keeps it from being too dull. There’s a few action features built into this ship, though nothing particularly obtrusive. The most obvious is are the two missiles which can be launched from the central engine. The stabilizer strut serves as a handle, and there’s a trigger at the top of it. It’s essentially a big gun. Shame that they went back to hard plastic missiles; this would have been a perfect place for Hasbro to work in some Nerf. It would literally just be a Nerf gun. The second feature is a detaching wing. When you press the turbine at the top of the engine, the right wing springs off, in a similar fashion to the wings on the TIE Fighter. I’m guessing at least one of these ships is losing a wing in the movie. The final feature is the ForceLink feature, which looks to be the same basic concept as with the figures. Oh, he’s a captain now, is he? That’s new. I think. I mean, I don’t know what his rank was before, if there was one. I’m assuming this is a promotion. Good for Poe. 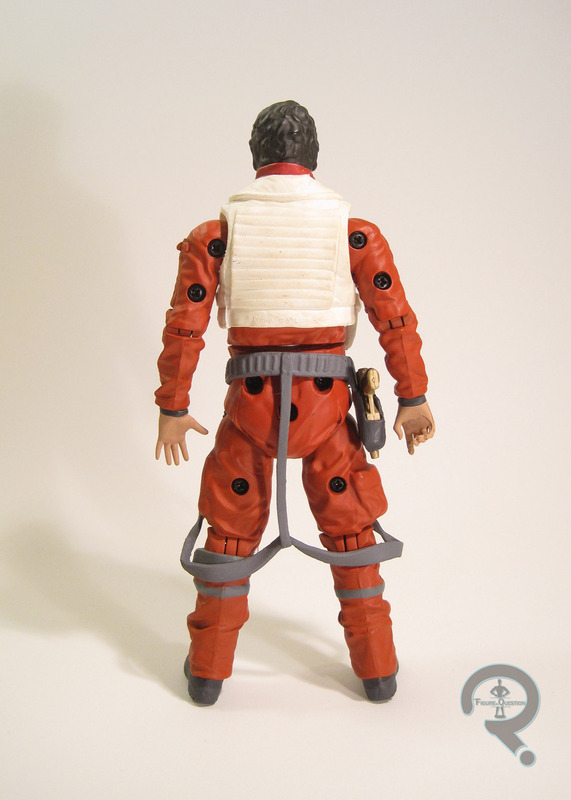 This figure gives us Poe in his casual gear from The Last Jedi. Since he gave his awesome leather jacket to Finn in the last film, he was in the market for a new one. Now he’s got this snazzy dark brown jacket, which makes him look not unlike Han from the last film. Or the Fonz. I guess cool guys have a consistent look. I’m not complaining. The figure stands about 4 inches tall and he has 5 points of articulation. The sculpt is all-new to this guy; nothing re-used from any of the prior Poes. The proportions are all well-balanced, and the detail work is all quite sharp. I dig the texture on the jacket. We’ve gotten yet another stab at an Oscar Isaac likeness on this new head sculpt. It’s not awful. It’s closer than earlier attempts, I think. His cheeks are definitely too pronounced, which makes him look ever so slightly like a young Al Pachino, but his not terribly far off. Maybe they’ll get it by Episode 9. One thing I think is probably helping this figure is the paint, which is a step-up from the last few figures. I did have to pick through a few sets to find the one with the best work, but they did seem a bit sharper in general this time. There’s still a bit of slop around the wrists, but that’s a minor issue. Poe’s packed with his blaster pistol (the same one included with several Poe figures), as well a headset, or as a like to call them: “Beats by Rey.” Yeah, I went there. It’s no secret that I’m a pretty big Poe fan. Ever since the first images of this set leaked, I knew it was going to be at the top of my list. It was actually one of the few items I didn’t find the week prior to Force Friday, which bummed me out initially, but less so in the end, since I wasn’t able to buy anything then anyway. This set was the very first item I grabbed on Force Friday. I almost got stepped on to get it, but them’s the risks you take, right? The ship’s pretty fun and I look forward to seeing it in action. Honestly, I kind of bought this for the new Poe figure, and he didn’t disappoint. Now, knowing my luck, he’ll end up released on his own in like a month. Still, this is one of my favorite items I picked up this time around. 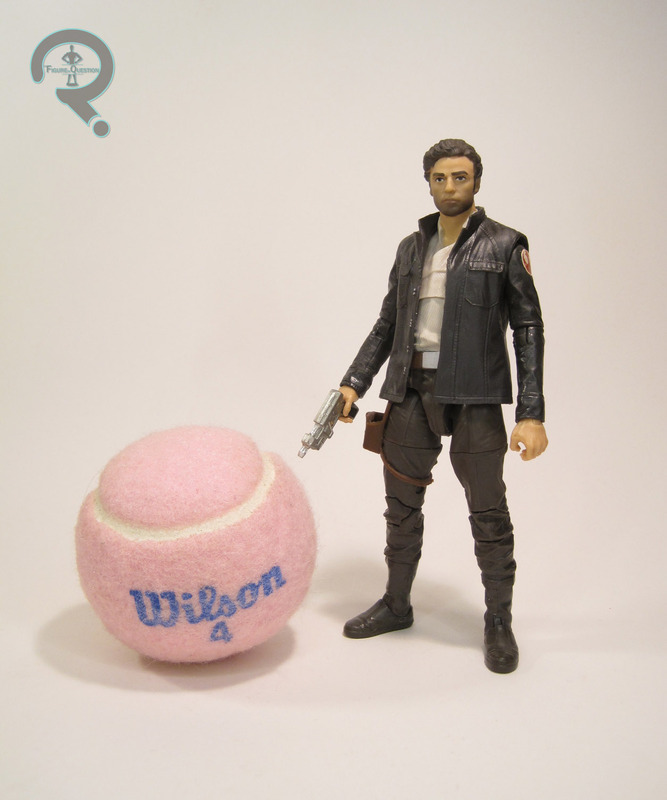 Last Friday was Rogue Friday, Hasbro’s second attempt at the whole “Force Friday” thing they tried last year. 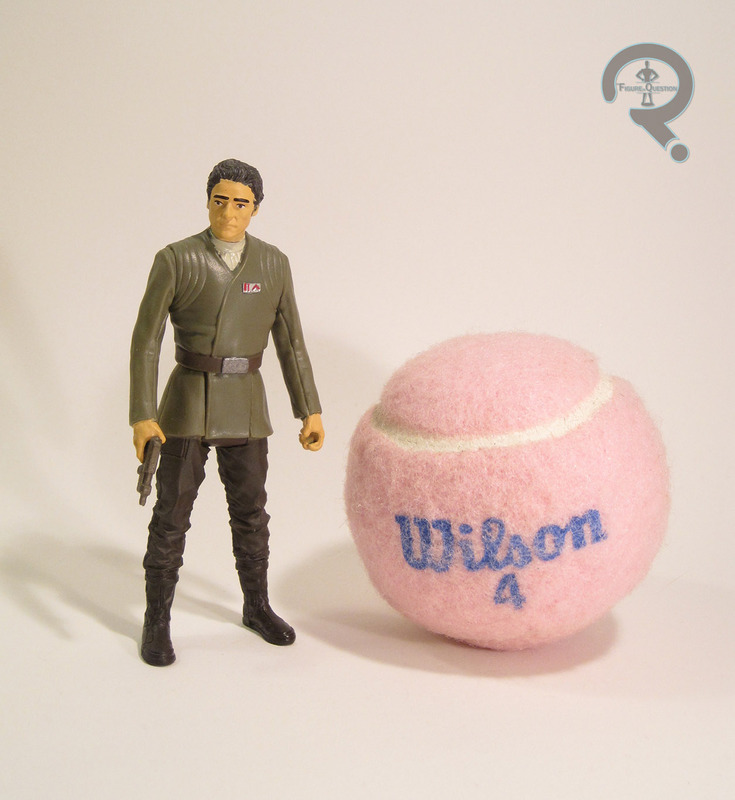 It marked the official launch of all of the Rogue One-related products. However, in light of the fiasco that was last year’s Force Friday event, most stores decided to forego the midnight opening event, with only Toys R Us participating. Super Awesome Girlfriend and I headed over to the closest TRU last Thursday night, and I picked up an assortment of Rogue One products. Today I’ll be looking that the first of the bunch, Poe Dameron and the First Order Snowtrooper Officer. Why are Poe and a First Order Snowtrooper in the Rogue One line? Well, it’s because it’s been a well-kept secret of Rogue One actually involves the Snowtrooper Officer being sent back in time to kill Jyn Erso and prevent the birth of Resistance fighter Rey. The only hope of stopping him was the Resistance’s own Poe Dameron, sent back to protect her. Wait. Sorry, that’s actually the plot of Terminator. My mistake. Right. Yeah, Poe and the Snowtrooper are just here because TFA product is still being released under the Rogue One banner, as is the case with most new Star Wars lines! I doubt Poe’s really going to be in the movie. Poe and the Snowtrooper Officer are one of the three 2-packs in the first Battle-Packs assortment in the Rogue One line. Each line has one or two Force Awakens products peppered in and these two are that portion of the Battle-Packs. I kinda love Poe Dameron. He’s easily my favorite part of TFA. So, I was pretty happy to see another Poe pop up with all the new figures. Of the three new main characters, Poe ended up with the most distinct looks. So far, we’ve gotten his jacketed look from the beginning of the film and his pilot look from later. The only one missing is his dress uniform from the very end of the film, which is the look this figure replicates. It’s admittedly a somewhat obscure look, since it’s really only seen in the one shot, but it’s cool to get it nonetheless. The figure stands a little under 4 inches tall and he has the basic 5-points of articulation that everyone should be accustomed to with these new Star Wars figures. Poe gets an all-new sculpt. That means we get yet another attempt at Oscar Isaac’s likeness for the head. It’s still not perfect, but I think this is the best version we’ve gotten from Hasbro yet. The rest of the body does a good job of translating the uniform we see on screen into action figure form, at least from the few reference shots I’ve been able to find (seriously, this is a short-lived look). One thing I do really like is that, even with it being a totally new sculpt, the pants and boots here are clearly the same ones on the jacketed figure. That’s consistency! The paint on this guy is alright, but not without issue. Sadly, most of those issues are on the head (again), mostly dealing with the hairline (again). It’s far from the worst paint I’ve seen from Hasbro, but it could definitely be better. On the plus side, at least he’s not as pale as some of the prior Poe figures! The paint on the body is pretty solid, as well, which is good. 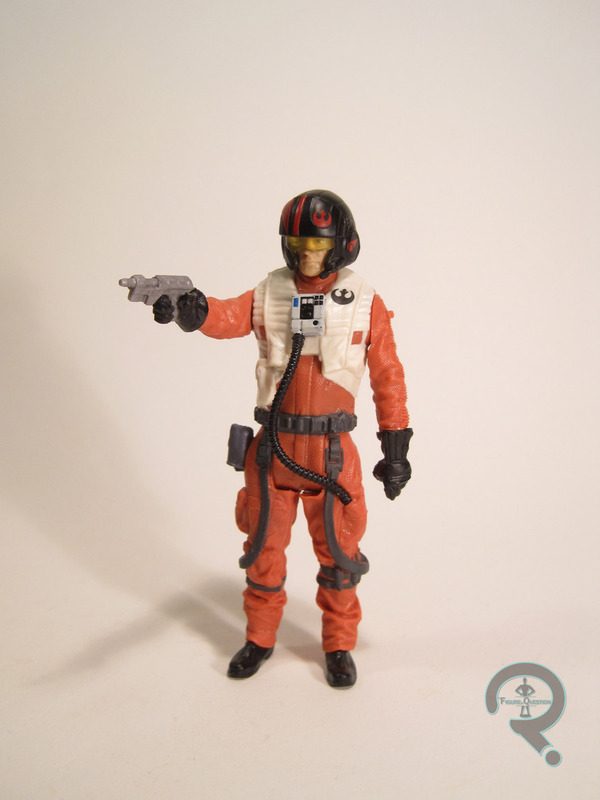 Poe includes a blaster pistol (the same as the one that came with his X-Wing pilot figure). He is also the figure in this set who gets the big honking missile launcher. Because Hasbro. 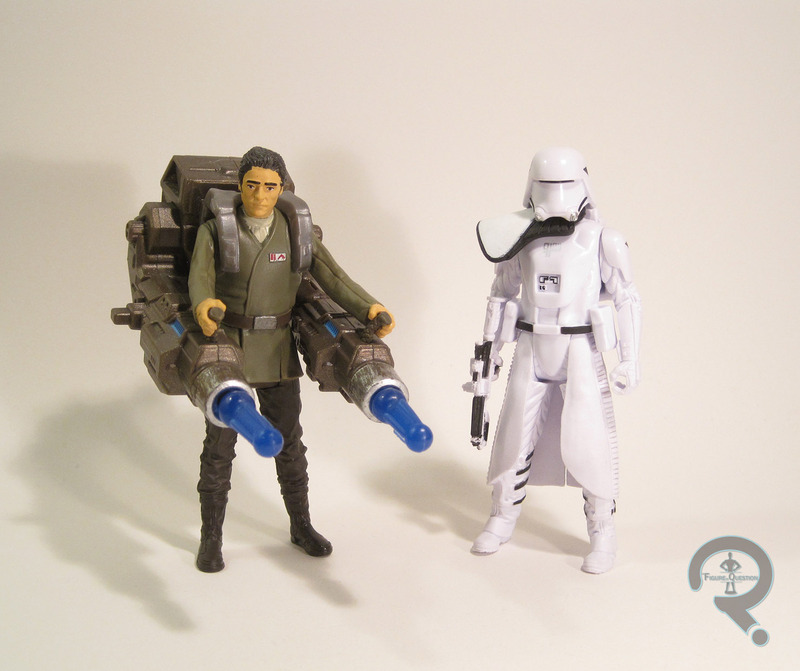 Befitting the “VS” nature of the new two-packs, Poe’s pack-mate is a First Order Snowtrooper Officer. He’s pretty much the same figure as the First Order Snowtrooper (reviewed here), but with an added shoulder pauldron. That means he’s still about 4 inches tall and has those same 5 points of articulation as everyone else. The Snowtrooper wasn’t a bad figure, but I’ve never been super into the Snowtroopers in general, so getting yet another isn’t exactly blowing my mind. Seeing as Poe’s a pilot, wouldn’t a Tie Pilot be more appropriate? I don’t know. This guy has the same accessories as his predecessor, a blaster with an extended stock and a back pack. So, as noted in the intro, these guys came from Toys R Us’s midnight event for Rogue Friday. Last year’s event was kind of a bust, so I wasn’t really sure what to expect this time around, and only even decided to participate a day or so in advance. Super Awesome Girlfriend and I showed up at the closest TRU at about 11:30 last Thursday night, and we were only the third people in line. I had a very pleasant conversation with the two guys in front of me (both older fans who were amused that someone my age was out for such an event). At 12:01, the doors opened, I made my way to the action figure aisle, and picked up most of the figures I wanted, this set included. I even got a free t-shirt! A hugely improved experience over last year. As far as the actual figures? Well, the Snowtrooper’s kind of blah, but I like the new Poe figure a lot. He might actually be my favorite of the smaller Poe’s we’ve gotten, even if he is in his briefly seen outfit from the end. Silver lining: now my TFA Leia isn’t all lonely in her final scene outfit! Man, it’s hard to believe it’s been over a year since The Force Awakens product started hitting shelves. This Friday, we’ll be seeing another midnight release, this time around for the products from Rogue One. With Force Awakens, there was a lot of product being released in a relatively short span of time, so it was a little difficult to keep track of it all. The main characters were available in a variety of scales, from a few different manufacturers. Of course, I’ve looked at Hasbro’s 3 3/4-inch and 6-inch lines, but the Disney Store also got in on the action, offering a line of die cast figures (die cast is just all the rage right now). The line more or less slipped under my radar. I knew it existed, but wasn’t quite aware of the depth of the line until rather recently, which is why I’m only just now reviewing my first figure from the line, Poe Dameron. 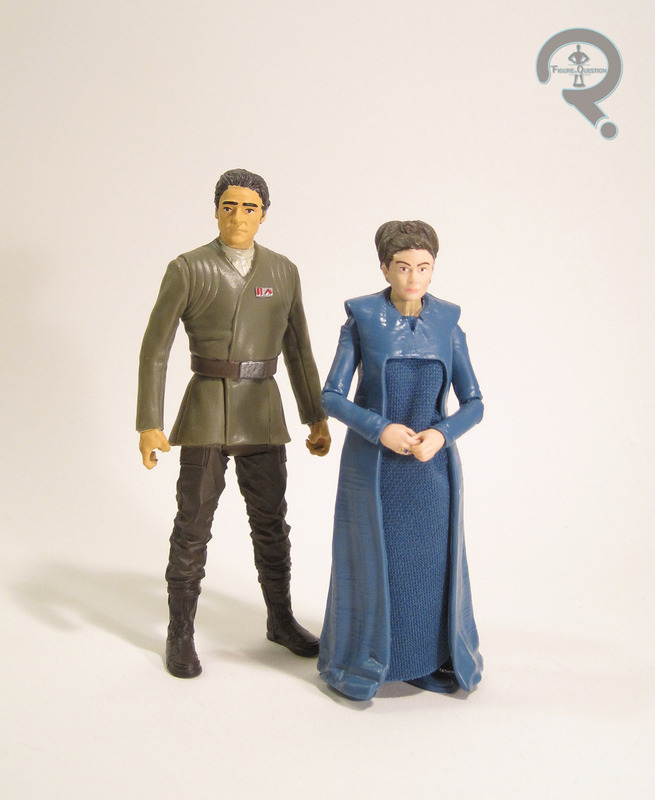 Poe is from the second round of the Disney Store-exclusive Star Wars: Elite Series. He was released to coincide with the movie’s release back in December, and was the last of the film’s three leads to make it into the line (Poe’s absence from the first series of so many of the lines is a bit odd, especially given how popular the character proved to be. Perhaps Disney under-estimated his appeal). The figure stands about 7 inches tall (placing him roughly in scale with most of NECA’s output, as a reference), and he has 16 points of articulation. He’s also reeeallly heavy, thanks to all that metal. His torso, pelvis, arms, and legs are all metal, with plastic being used for the head, hands, feet, belt/tubes, and a few of his joints. Poe’s certainly constructed from a lot more metal than a lot of die cast items, which is actually pretty cool. It results in the figure being a little less posable than I might like, but the sheer heft of this guy is pretty nifty, and you can still manage some decent poses. As far as the sculpt goes, Poe’s overall not bad, but not without a few issues. On a whole, the details seem a little soft. I’m not sure if it’s the sculpt or the paint, but he’s got a certain animated feel too him. I’m also not really a fan pf the left hand, which looks a little like it was replaced by an inflated latex glove, due to the weird, puffy absence of a palm. Possibly the most notable issue is more a construction thing than anything. In order to be properly assembled, Poe needs to have 9 visible screws on his back, apparently. That seems a little excessive to me, but I could be wrong. At the very least, they aren’t visible from the front. Moving past those issues, I think Poe’s actually got a pretty decent sculpt. In particular, the head, I feel, is a better Oscar Isaac than we’ve seen elsewhere. It’s still not perfect (it would appear he’s the Harrison Ford of the new trio in that respect), but it looks pretty good. Poe’s paint is alright, though it’s kind of basic in terms of color, and a little sloppy in more than a few areas. It’s also quite thick. Plus, I’ve already noticed one or two chips on mine, which is slightly frightening. I’ll be interested to see how it holds up in the long run. Poe included his small blaster, his helmet, and a display stand. The blaster and the stand are both pretty cool, but the helmet is a slight letdown, due to the opaque nature of the visor, and the fact that Poe actually can’t wear it. I got Poe from the Disney Store that was in the same mall as the Apple Store where I was buying my new computer. I actually wasn’t aware that they had made a Poe in this line, so he was a nice surprise find. He’s not a perfect figure but I think he might be my favorite Poe straight out of the box (my amalgamation of the two Black Series Poes is still my favorite overall, though). Poe is still my favorite part of TFA, so it was really cool to find a new Poe to buy.